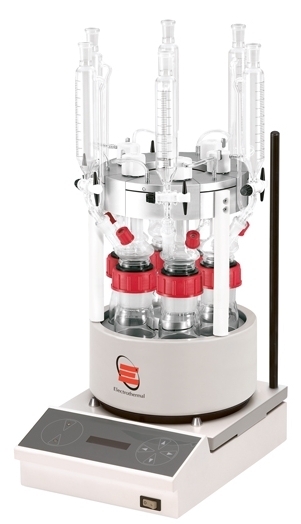 The heart of the Electrothermal Omni-Reacto Station is the base unit which can accommodate a variety of cartridges and sample volumes from 2 to 1000ml. All heating blocks, glassware and reflux heads are interchangeable. The Omni-Reacto Station footprint is compact and can be placed into any fume hood, or onto a small bench space. The Omni Reacto Station has recently been upgraded to offer greater flexibility and productivity for bench top chemistry. The rugged controller design has been retained as users prefer the stability that it offers as more complex systems are built up and developed. Greater stirring stability and speeds of up to 2000 rpm. Simple menus and touch pad interface. A new display to improve menu navigation and the viewing of system performance. All heater cartridges are equipped with "in block heaters" that allow temperatures up to 220°C (300°C on request). A high level of stability (± 0.3°C) across the heater cartridge itself. An outer casing to retain the "cool to touch" safety feature that so many of our customers value. Select cartridges can also be used in conjunction with a cooling plug to extend the temperature range from - 30°C to 220°C. Models in this range include OS6050 (Series 6050), OS6100 (Series 6100) and OS6250 (Series 6250).